Our airblocks are also made from 304ss with a tolerance of +/- .005. They are 1/2" square X 3/4" long with a 1/8-27 pipe thread. We stock no hole, 1/8" side hole, 1/8" bottom hole and double end with 1/8-27 npt on both ends. 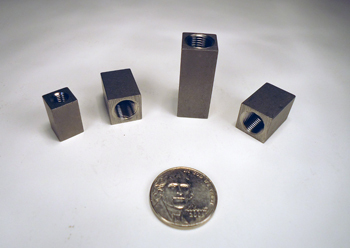 We also stock a 3/8" square X 5/8" airblock with a 10-32 thread, 1/8" side or bottom hole.